"This has been a big hit for many years as an appetizer, or just for a snack. It is always nice to have when friends drop by, and it freezes very well. If you enjoy nuts, roll the cheese ball in about a half cup of chopped pecans. Serve with crackers. Refrigerate overnight for the best flavor." Process dried beef, Italian-style dressing and cream cheese in a food processor until well blended. Transfer to a medium bowl. Chill until firm enough to form into a ball, about 2 hours. See how to make a holiday cheese ball that looks like a pine cone. This recipe was the biggest bust I've ever served. Not one person took a second cracker. It was so salty nobody liked it. The recipe shouldn't be salty. The dried beef has to be washed off before using. Most brands of dried beef will state this on the package. Hope this helps. 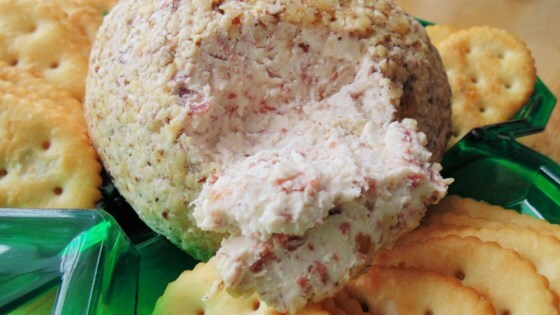 This cheeseball is so simple and delicious! We've been making it for years and we love it. It is now for those watching their sodium intake, however!